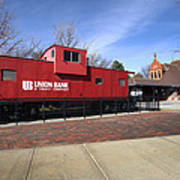 Caboose mounted on tracks in front of the Union Bank in Lincoln Nebraska. 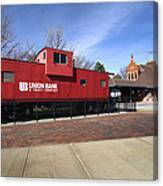 This bank office was the train depot at one time. This is a Chicago Rock Island caboose that is used at the end of a freight train to house the crew while travelling. The interior is furnished with all necessary items for the railroad workers away from home. 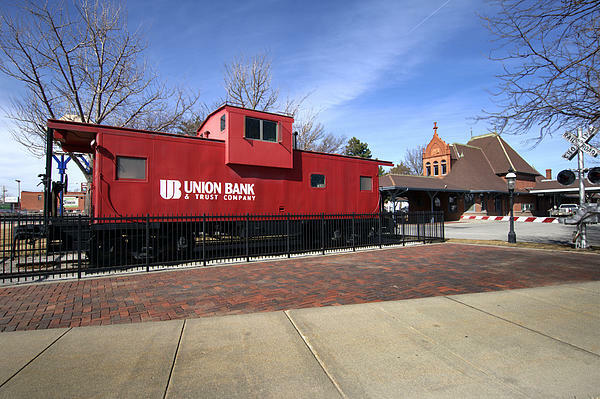 This caboose is displayed in front of Union Bank Lincoln Nebraska which use to be the railroad depot at one time.